By now you probably understand that I’m a supplement junkie. My addiction started in college, all thanks to my buddies. It seemed that every time I went to the gym they were talking about something else they tried and got great results with. Of course I had to try it out too. One of the main supplements we always seemed to talk about besides pre-workout supplements were post-workout recovery supplements. For years and years I studied and tried out many various recovery supplements hoping to find the one that works best. Eventually, I came across a brand of supplements that were clean, but extremely effective called the Performance Line. The Beachbody Recover formula from the Performance Line was a post-workout supplement that I used for quite some time while going through multiple rounds of a program called Body Beast. As I was trying to put on mass, I knew the importance of having a good quality supplement to take right after my workouts. Recover was exactly what I had hoped. Here is my Beachbody Performance Recover Review. Why Use a Post Workout Supplement? Before I actually get into my Beachbody Performance Recover Review, I want to talk a little bit about why it’s important to use a post workout supplement. When you do an intense workout like what I do every day, you drain your body of glycogen and protein. After you get done with the workout, you have about an hour time span to consume either good quality food or a post-workout supplement that will help replenish the glycogen stores and kick-start the muscle repairing process. That supplement or food needs to have a great balance of fast digesting carbohydrates and important amino acids. The fast digesting carbs will help transport the amino acids to the muscle cells quickly, therefore aiding in protein synthesis (muscle recovery). I have used both food and supplements for post workout recovery, but supplements seem to be more effective for me, probably because they are designed to have everything I need for proper recovery, whereas I might not get it all with food. A good quality post workout supplement will reduce soreness and aid in proper muscle recover. When I’m judging a post-workout supplement, I do so in 4 different areas: (1) Quality, (2) Taste, (3) Consistency, (4) Effectiveness. I’m going to break down the Recover formula regarding each of those areas. (1) Quality. On a scale of 1-10, I would rate the quality a 9. Out of all the ones I’ve used over the years, this one is by far the best quality. The sugar in Recover is actually beet sugar and the rest of it is sweetened with Stevia leaf extract. Most post-workout supplements are loaded with low-quality processed sugar, mainly to make it taste better. 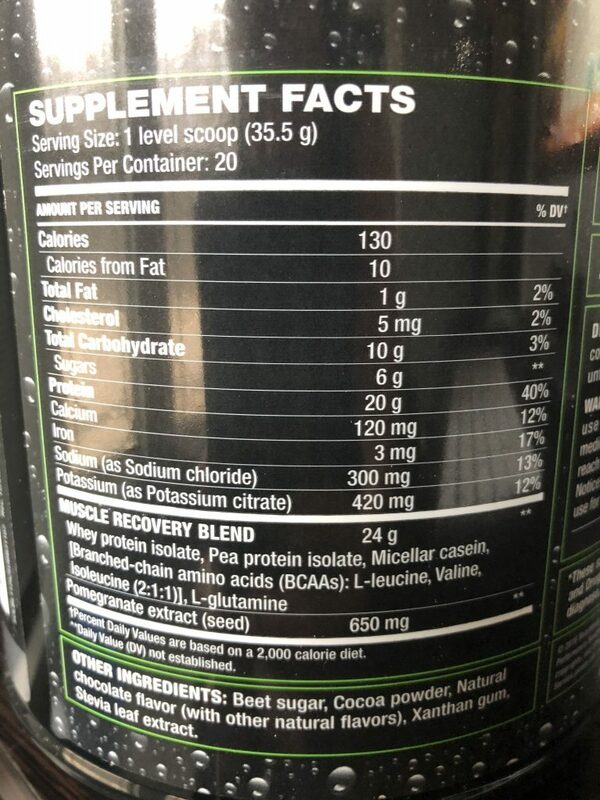 In addition, Recover has a 2:1 protein to carb ratio, which is excellent for recovery. The protein comes from whey isolate, pea protein, and contains a number of additional important amino acids. There are no added chemicals, dyes, or other toxins. (2) Taste. On a scale of 1-10, I would rate the taste a 9. I love the taste of both flavors of Beachbody Recover. Back in the day Beachbody had something called the Recovery Formula (which isn’t nearly as good of quality as Recover), but the orange flavor tasted like an orange creamsicle. The orange flavor with Recover is very similar to that. Not as good as the old one, but still very good. The chocolate flavor tastes like chocolate because that’s what it is, chocolate. It’s hard to mess up a chocolate flavor. (3) Consistency. On a scale of 1-10, I would rate the consistency a 10. It’s a very powdery substance and mixes very well. Normally I just put it in a shaker cup and shake it. (4) Effectiveness. On a scale of 1-10, I would rate the effectiveness a 9. All I know is that when I use Recover I tend to get outstanding results. My recovery time is shorter and I don’t experience as much soreness as I normally would without taking anything after my workout. So that’s it. That’s my Beachbody Performance Recover Review. If you’re interested in purchasing Beachbody Recover, just click here. If you have any questions about it, feel free to email me at Josh@JoshSpencerFitness.com. Thank you Josh! You always rock!